Today's post was supposed to a review of the new Blue Smoke (Battery Park City), but alas I was canceled on. Yes, I agree what's better than a night with Gramercy Girl? Apparently, a night without her. So I am going to the the suggestion of the Senator and start a monthly post highlighting product fails. We all go to the store and buy something that has a great description and a beautiful picture on the package, only to come home try it and say blech, what was I thinking and throw it away. Well to pay homage to the Senator for the great post idea, I'm using his product review. 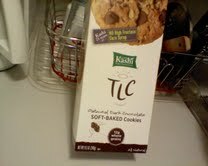 While he stayed home and missed a great meal Sunday (Theme Night Tailgate) , he picked up some Kashi TLC cookies. Hey I like Kashi products, they have great bars and I like their Go Lean Crunch with yogurt for breakfast. Here is the Senator's review, "If you like eating sand and raisins." I don't think much needs to be said after that. Thanks, Senator!